Hiller's annual Halloween extravaganza! Come in costume and explore the Museum's Gallery - you'll find hidden haunts and ghoulish surprises amidst your favorite exhibits. Build a creepy craft, join the games in our Aerial Carnival, and add a special Halloween greeting for on our witch's flying pumpkin. The excitement concludes daily as the witch takes to the skies by helicopter to send her pumpkin plummeting to a smashing conclusion. Candy, prizes and spooky surprises make this Hangar Haunt an extra-special occasion for ghosts and goblins of all. Sunday, October 31 (1-4 p.m. - pumpkin drop at 4). Cost: Free with admission - kids under 4 are free. 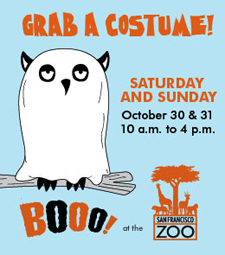 Children who come to the Aquarium in costume get free admission, when accompanied by an adult. Pick up a freaky fish facts scavenger hunt to take with you through the Aquarium, helping you get even more up close and personal with more than 20,000 denizens of the deep. Cost: Kids free with costume. Adults $16.95. Come in costume, and see the museum transformed into a haunted wonderland complete with games, attractions, and live entertainment. Enroll in the witches' school, take a train or pony ride, visit the petting zoo andenjoy a full brew of games, activities and live entertainment. Tickets: available at the door. All activities are included. Members $13; General $15. Children under age 1 are free. Michael's Arts and Crafts - Halloween crafts at the store. Through Halloween, on Friday, Saturdays and Sundays in October from 7 p.m. to midnight, you can experience 6 haunted mazes, 4 themed scare zones, 4 head-turning live stage shows, plus the park's rides. This isn't for the young kids. Halloween Haunt is a special ticketed event and requires a separate ticket. Admission to Great America's Halloween Haunt is $20 for season pass holders. Kids must be 13+. Online you can get discounted tickets to Halloween Haunt at Great America - 2 tickets for $55. Otherwise, tickets sold at the park are $40. You can get a Boofet dinner for $13, which also gets you into the Haunt a few minutes earlier. I love this festival! Kids can carve pumpkins, watch teh giant pumpkin weigh in contest, watch master carvers, jump in bounce houses and more. Read my review of past Half Moon Bay Pumpkin Festivals here. Here's the schedule of events for the Half Moon Bay Art and Pumpkin Festival. Ride the spooky boo train (free if you wear a costume). Enter the costume parade. See how the animals celebrate Halloween. Bring a teddy bear for a teddy-bear check-up. Walk the Haunted Nature Trail, explore your way out of the Rainforest Maze Adventure, trick-or-treat throughout the Zoo and more. Check out Puppet Art Theater and Witch Hazelnut's spooky stories, make some scary crafts and even see some "creepy" critters during this "spook"tacular event. Plus, you won't want to miss seeing the Zoo's animals enjoy some special treats of their own during the Pumpkin "Stomp 'n Chomp." No rubber masks please, Too scary for the animals! Free KidsWorld event in October to celebrate Halloween! Kids come in costume and enjoy games, crafts, learning and more! Sponsored by Grandpa Kevin's Pumpkin Patch located in the Target parking lot. Bring the family for a Spook Parade and Costume Contest. Contestants are children 12 and under. Prizes and more - get photos with Beetlejuice, candy, prizes and more! Halloween fun including indoor trick-or-treating at participating Serramonte stores. Participating stores will have balloons in front of their store signifying they'll distribute candy. Children under the age of 15 must be accompanied by an adult. Participating stores will hand out treats to costumed children ages 12 and under. Kids will also enjoy Halloween themed special events including juggling, balloon twisting, cookie decorating with Mrs. Field’s and spooky science with Mad Science of the Bay Area, as well as performances from Capt’n Jack Spareribs and Comedy Magician Timothy James. When: Sunday, October 31 from 5-7 p.m.